Wooden furniture eventually wears out, especially simple pieces like wooden benches that suffer frequent use, whether indoors or outdoors. Outdoor benches tend to wear out more quickly and need replacement, repair or recycling. Repairing a wood bench allows you to reuse the item instead of purchasing or making a new bench. Measure the height, width and thickness of any broken wood pieces. Use these measurements to find or purchase replacement wood pieces of the same size or larger. If necessary, cut other pieces down to the sizes necessary to make the repairs and replacements of existing, broken pieces. The compass or straight edge will assist you in making angled cuts. Cut the replacement wood pieces with the appropriate power saw. A miter or table saw will work to make straight or angled cuts, while a jigsaw is best for curvy cuts. Avoiding using replacement pieces that require you to trim off thicknesses or widths; try to find pieces you only need to trim the length on or cut angles or curves into. Remove the existing broken pieces. Unscrew or pry the pieces loose. 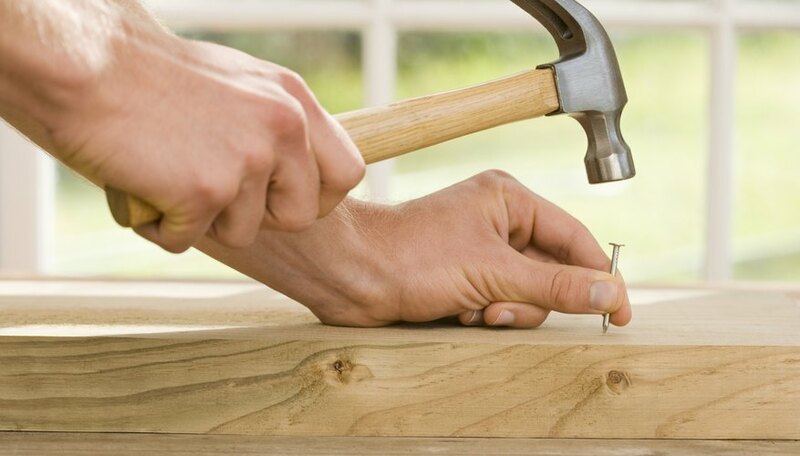 Nail or screw the new pieces into place using existing nail or screw holes if possible. If you cannot use previously used holes, fill the holes with wood filler. Sandpaper away the rough spots on the new wood pieces and smooth down spots you covered with wood filler. If necessary, sand off the existing paint and stain on the piece to apply a new coat with an even color and finish. Paint on a couple new coats of wood stain or paint on the wood bench. Allow a day for drying between each application and a day of drying before using the bench for seating or placing items like flower pots. Paint or stain the bench while outdoors on a sunny day to avoid the buildup of fumes in a tiny space and lightheadedness from inhaling the fumes.